Homemade wooden wagons serve a variety of purposes from children's toy to gardener's cart to landscape item. Wagons can be built and customized to suit individual needs using basic carpentry. 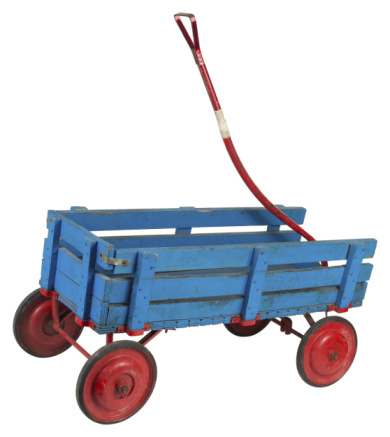 Paint the wagon any color and allow children to decorate it for their toys. Gardeners can add heavy items to the wagon because of the support added underneath the base. Homemade wooden wagons are easy to construct. Determine the size of the wagon base. This will determine the size of the plywood sheets. Cut one sheet the length and width of the desired base. Sand this sheet to a smooth finish. Measure the width of the plywood sheet. Cut three lengths of board the width of the plywood. These will become the braces and wheel supports. Lay one of the boards at each end of the sheet widthwise. Lay the third board in the middle widthwise. Glue each board to the plywood with wood glue and allow to dry. Turn the sheet over. Screw the sheet to the boards with four screws per board. Turn the sheet over so the boards face up. Attach the wheel kit with screws to the outer boards. Turn the frame over so the wheels are on the ground. Move the base around to ensure the wheels are freely moving. Measure and mark two lengths of the plywood sheets to the length of the base. Measure and mark two lengths of plywood to the width of the base. Cut the measured pieces. You should have two long pieces and two short pieces. Line up one of the sides flush with the corresponding corners of the base. Hold the side board in position as you drive a screw through the side into the base near a corner. Repeat the process at the opposite end of the side. Line up an adjacent board perpendicular to the first. If you used a long board as the first side, use a short board for this step and vise versa. Continue following this process until all four sides are mounted on the base. Drill two more screws into the end boards and three more into the side boards. Attach two "L" brackets to the inside of each corner with screws. Set one at the top and one at the middle of each corner. Drill a hole through the 2-inch side of the ¾-by-2-inch board at one end. This is the end that will attach to the wagon via the double-sided bolt. Slide the end of the board with the hole into the swivel base. Thread the bolt through the swivel base and the board. Screw a nut onto either end of the bolt to secure it to the handle.